One of the most famous sights in Italy has been given a new lease on life. The Leaning Tower of Pisa, with its spiraling rings of loggias (slender columns), is undoubtedly one of the most famous and beloved monuments in the world. In early November, I visited the 12th century tower, which took 200 years to build and has survived earthquakes, war, and even government debate. 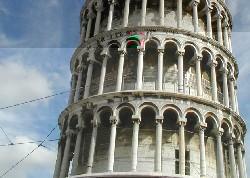 The dramatically leaning tower has always seemed to be in peril, but mainly due to the unstable ground surrounding it. It's as though the tower could have only stayed up due to some sort of divine intervention. After all, as it sits upon the Campo dei Miracoli (Field of Miracles), the massive engineering feat to save it has been nothing short of a "miracle." In 1990, the structure was closed to the public. 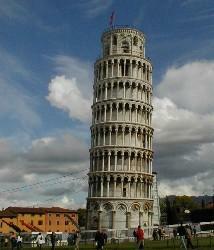 It was deemed to be leaning too far for tourists to climb safely. To lengthen the life of the tower, and let tourists resume their 294-step climb to the bell chamber, engineers, scientists, and historians set out on a remarkable journey to correct the tilt (a bit) and help preserve this beloved wonder. Because there are few documents that record the tower's history, historians and engineers had to track the progression of its tilt by studying 14th and 16th century paintings. They also studied measurements taken by 19th century English and French architects. After compiling all their data, scientists and engineers devised a relatively safe way to straighten (and strengthen) the structure…slightly. It took a little over 11 years to change the 190-foot tower a half-degree in tilt, a difference that is indiscernible to the naked eye. Several tons of sandy soil at the tower's base were delicately removed and replaced with firmer soil; while at the same time, cables attached to huge lead counterweights pulled the tower backwards. It is estimated that these improvements should keep the tower safe for the next 300 years. Come November, the steel cables supporting the tower will be removed, and visitors, now kept back by an iron fence, will be able make the dizzying climb in one of the world's premier monuments once again—all thanks to the "miracoli" of science. Pisa was one of the Mediterranean's most important ports between the 11th and 13th centuries, and to signify its importance to the world, the inhabitants set out to build a grand bell tower. Construction began in 1173, but had to be suspended five years later due to political strife. At this point, the tower had reached its third level and was left untouched for over one hundred years. Over that period, the structure began sinking. The building of the tower resumed in 1272, and by 1284, the tower had reached its seventh level. Then, during that last year, Genoa defeated Pisa in the battle of Meloria, and construction was halted yet again. At that time, the tilt was evident, and masons tried to in vain to correct it by changing the thickness of the marble as they built upward. Around 1365, the belfry was added, but was placed slightly north of the tower's original axis in a further attempt to compensate for the tilt. It is interesting to note that the delays in construction turned out to be a blessing in disguise. Engineers believe that if the tower had been built all at once, the clay surrounding it would have given way, and the tower would have fallen. The tower is definitely Pisa's star attraction. In front of the tower, tourists giddily pose for silly pictures that make them look as if they are holding it up. And yes, there are endless stalls around the tower that sell all the staple Leaning Tower tchotchkes like salt and peppershakers, mini-replicas, and cigarette lighters. Nevertheless, you will find more caf�s, hardware stores, and Vespa (motor scooter) shops than tourist traps in this town. 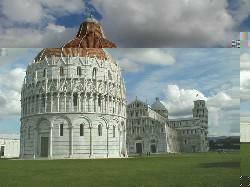 Besides the tower, Pisa has several other significant sights. For example, the Duomo, the Cathedral of Pisa, is famed for its Romanesque panels depicting the life of Christ. The Museo Nazionale di San Matteo contains other dramatic examples of Romanesque (and Gothic) art. In addition, Pisa's streets are very intriguing as they hold many charming buildings and delightful piazzas, which are all bathed in those restful Tuscan oranges, browns, and yellows. Pisa also has one of the most culturally packed squares in Europe, filled with Italians, gypsies, and foreign visitors all intermingling. Pisa is definitely a great place to visit—tower or no tower, leaning or less leaning.